Conquer 2017 With Kickass Contouring! It was that time of the year again when all the beauty geeks and gurus, and fashionistas were called for! The aim of this workshop was to preach the power of transformation through makeup and get beauty lovers equipped in their makeup skills for special occasions. Makeup is something that can make or break one’s look. 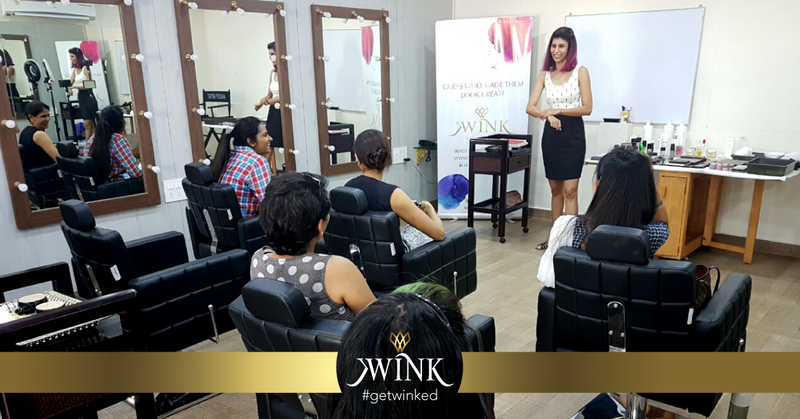 People from all walks of life showed up at this amazing 6 hour ‘Makeup Workshop’ to learn the tricks and trades of nailing their makeup from our celebrity stylist, Samantha Jagan. Sounds like the perfect Treat-Yo-Self Day, doesn’t it? WHAT WAS THE WORKSHOP ALL ABOUT? Anything and everything related to beauty, looks & style for the special day! A day that was full of fun, education and inspiration, and of course all things stylish! HOW PEOPLE TOOK PART IN THE WORKSHOP? Interested people were asked to register by calling 044 42148555 and reserve their spots for the workshop! Well, the journey that looked like an absolute bomb didn’t stop there. People who attended this workshop were handed over vouchers worth Rs. 2017/- which they could use to avail WINK’s services in future. Interesting enough! Get sparkling, get glowing, get gorgeous, get WINKing! Check out our services and get set to WINK in style! WINK Salon 2017 | All Rights Reserved.